Further Experiences with Iontophoresis- Success! Since my first treatment with the R.A. Fischer Iontophoresis device, I have been able to work the device myself without help. If you work the machine yourself, it will take 40 minutes, even if you are just treating your hands. While by myself, I use one tray for my left foot and one tray for my left hand. I am then able to work the machine with my free right hand. After 20 minutes, I repeat with the right hand, using my left hand to work the machine. Generally, I will only feel a little discomfort when using the device with the vibration sensation. However, I have felt pain during a few treatments. Sometimes my hands or feet will feel like they are burning. When this happens, I immediately decrease the milliamperes until I feel comfortable again. The pain may be caused from excess tap water in the tray. The extra water by my wrists causes some pain and I noticed after the treatment that my skin near my wrist turned red and it was also itchy. After the first treatment, I even noticed a little swelling. The swelling went down within a few hours. I have also experienced a red line along the entire side of my hand, from where the water level rested. You can see this in the picture below. Don’t worry- the red irritation goes away. My hands were fine by the next morning. R.A. Fischer president, Bill Schuler, suggests if switching charge midway through the treatment causes discomfort, I can switch every other treatment instead. So far, I haven’t had a problem switching mid-way through. Bill also suggests that you use the machine every other day for the best results and that results are most commonly seen after 6-10 treatments. After that, I read that you may use the machine as needed, usually once every 2-4 weeks. Although the NYC heat is doing its best to work against me, I am seeing results with the device. I have even tried to will myself to sweat and am unsuccessful. Is this too good to be true? I still feel the same sensation as when my hands and feet did sweat. My hands and feet get very hot and tingly, but my palms and soles of my feet are dry. The sides of my fingers and feet will get clammy but I think that is because the water in the trays does not reach that area. This doesn’t really bother me. Also, I am happy to report that I have experienced no compensatory sweating from Iontophoresis! I have finished initial treatments but I am going to keep an eye on my progress and will continue to devote my time to the machine when needed. I will keep you posted, but so far, I recommend this machine to people with HH! Irritation from the Iontophoresis device. This goes away fairly soon. OMG! I need to do this. I really have to find out how I can get my sweaty little hands on this. Any idea? I am in a suburb outside of Chicago. I love your posts! Makes me feel less odd to know someone else has the same problem as I do. Hi Valerie- Thanks for your comment! I really recommend the device and suggest you get in contact with the R.A. Fischer company. The machines are an investment, but certainly worth it and will last you! Just check out: http://www.rafischer.com. I’m happy that you are able to connect with my blog and I hope some tips are helpful. Stay cool this summer! I have been using the Fisher MD-1 since 1985 and found it is the best possbile solution to palmar hh. It works great and is a much better alternative to ETS surgery with little or no side effects. The only problem is that it gets tedious doing it every day at the beginning or every other day later on in the treatment program. It usually takes about 7-10 treatments to achieve results, so not to be discouraged when it does not work for the first number of treatments. Treating yourself takes approx. 45 minutes (one hand and one foot at a time). It is well worth the investment for people that struggle with palmar hh. I find that the results lasts about 6-8 weeks, even if you do not use it during that period of time. Hi, it is so nice to read that the device is working for you, Caryn, and others. I looked it up, it is very expensive! You are lucky to receive it free. Could you comment more on how you deal with the NYC heat? I also live in a large city and the heat is especially terrible this summer. Ugh, I know, the heat is so bad this summer! I try and deal the best I can. I take the bus instead of the subway if possible to avoid the hot platforms waiting for a train underground. I get to work early to take advantage of the air conditioning. I try to do things that will keep me cool like going to movies, museums, or restaurants. I try really hard to stay out of the heat unless it’s evening and starting to cool off. If I’m not at a cool place, I’m at my apartment in front of the fan! Keep drinking water to help stay cool and carry around a towel to mop up sweat! I also wear closed toe shoes all the time so I don’t slip out while I’m walking. Good luck! Did you need a prescription to buy one of these machines? Yes, I did need a prescription. You can ask a dermatologist or family doctor. I am having severe sweating at the back and front of the hand..i dont know how to treat back of hand using iontophoresis.. I haven’t had success with the back of hand sweating either using Iontophoresis. My advisor says that Iontophoresis will only impact the part of the hand that is submerged in water, so maybe increase the water level (but stop immediately if it starts to hurt!). Hi, I am 17 and have had hyperhidrosis for years now. I have tried pills, and the topical material. The pills are quite ineffective. They dry out places that don’t need to dry out, while my hands remain moist. The topical stuff makes my hands too dry, to the point of looking scaly. My question to you is: Does this machine make your hands looks scaly? I believe I have a minor case of HH, but enough to affect my life in a very negative way. Any answer would be appreciated. Thanks! Hi Ryan! Thanks for writing in! I agree that the pills and topical medication made my hands very dry and scaly looking. 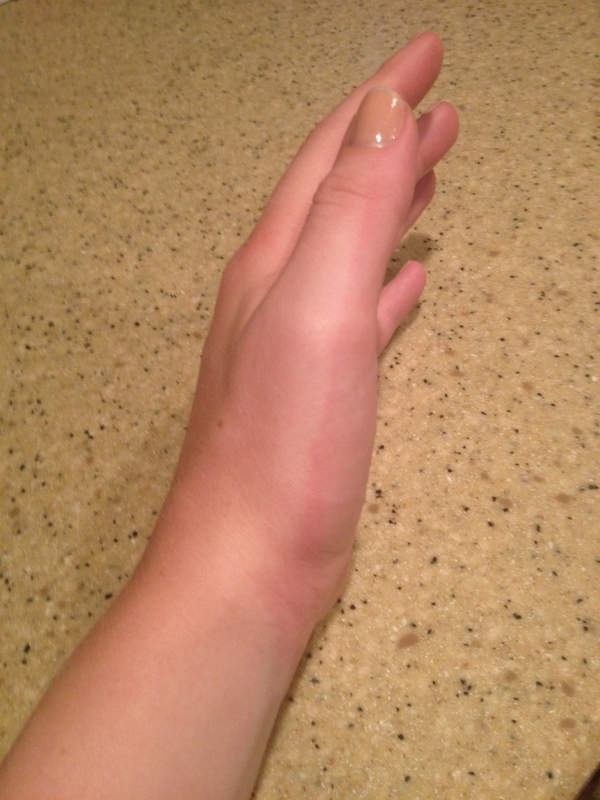 The Iontophoresis treatment does not do this! If anything, my hands will just be more red for a short period of time due to irritation. I hope this helps! Are you still using iontophoresis? have you had any issues such as compensatory sweating since using it? Hi Leighton! I’m still using my machine and haven’t noticed any compensatory sweating with it. Are you using the device? The machine is working for me! Some treatments are a little painful, but the results are worth it! Best of luck! You dont need to buy anything expensive for this treatment. You need 3 6 volt batteries (those rectangular ones with 2 springs on top).Wire them together in series with regular wire and alligator clips. Youll need to extra wires which you will connect to two alluminium pie plates ( the cheap throwaway ones). Fill the pie plates with water and put your hands in. I have the worlds sweatiest hands and its plagued me for years but this has worked for me. Massive improvement. Check youtube for videos on how to do this method. Its cheap, its easy and it works!!! Hello! I have been using the Ra Fischer MD-2 device, unfortunately, I’ve had no success. I did 30 normal treatments of 30 minutes at 20.0 m.a, then I tried 8 treatments of putting baking soda, and currently on 5 treatments using crushed Robinul tablets in the water, which probably won’t work either. I don’t treat one hand/foot at a time, I just do both hands then feet. I’ve been doing treatments every other day, and just want to know if you’re still seeing your results, what m.a do you use for your treatments, and how long are your maintenance treatments? The entire process lasts a little over 40 minutes because of set up, switching sides, and increasing and decreasing the m.a. from 0 to 12. I have used baking soda in the water before and that helps. As for the Robinul tablets, I used to ingest them, so I’m not sure if crushing them into the water will make a difference. Do you ever ingest the tablets? I started seeing results after I used the device every other day in this exact step process for 10 treatments. Now, I use the machine once a week. I still sweat on the areas of my hands and feet that do not get covered by the water in the trays, but the sweat has stopped on my palms and soles. My palms have only occasionally gotten clammy.